This review is crazily overdue, and I'm ashamed at how long it has taken me. Bad Kitty. 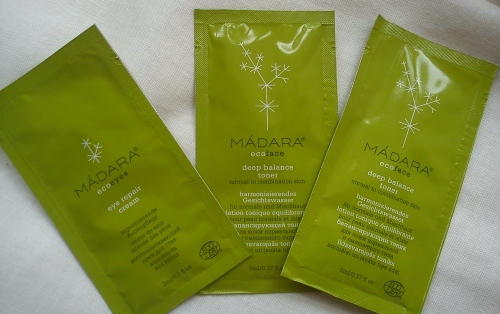 But, I am a huge fan of Madara products, so this really is a case of Better Late Than Never. 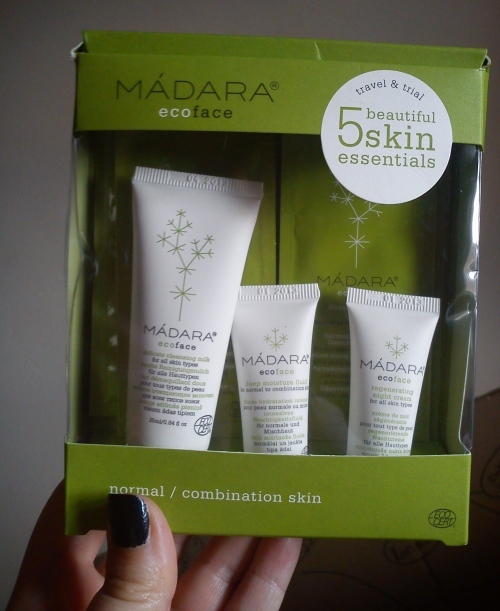 Noting that I actually have oily skin, rather than Normal/Combination, I was a little bit apprehensive about this kit, but as a whole I love the size of the products, because they fit perfectly into luggage which is great for travelling, and since they're so small in size, I guess they'd be fine for hand luggage on a plane too. I've taken some items of the kit on several weekends away, and they've been a great addition when I've been trying to travel light. In the past I've not been a huge fan of cleansing milks, because they tend to feel too heavy on my skin, however I found this one to be quite light and it didn't dry my skin out like some cleansers do. I don't really know if it was good at removing make up (as it claims to in the product description) purely because I tend to take my make up off with a make up remover. I was happy that it genuinely was gentle around the eyes, because my eyes are easily irritated, so that was great! 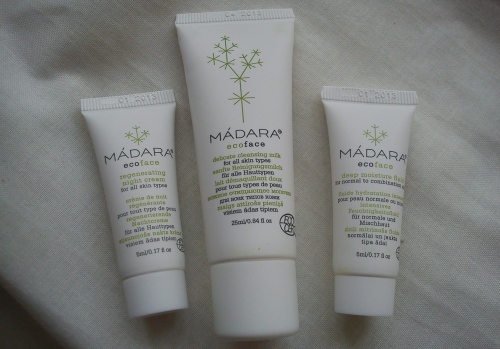 I actually already use Madara's Deep Moisture Gel, which I reviewed last year, and I really love that moisturiser. It's so different to any that I've ever used before, and I love the way it smells and feel on my skin. The fluid, however, that came in this kit, was a little bit too heavy for my skin, so I think that I would definitely stick to the Gel one, rather than the Fluid. I have to confess that I'm not very reliable when it comes to using night creams, because I always forget to put one on, mainly because they feel so heavy when I put them on. I know that they're supposed to be like that, because they slowly seep into the skin overnight, but I just hate that feeling of heaviness. This one wasn't too bad, when I remembered to use it, but it hasn't encouraged me to use night creams any more than others. I never thought I'd say this, but I really liked these toners. You actually get two sachets, and one sachet lasted me about three or four applications, which I didn't think was too bad. I found them to be really cooling, which I liked and they left my skin feeling clean and fresh. What more can I say? They did their job without feeling rough. As I have quite sensitive eyes, I'm a bit wary about using products on my eyes and only really use eye drops and my Garnier Eye Roller. 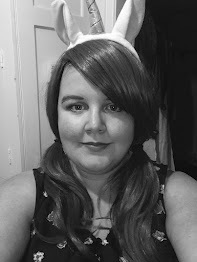 My eyes are that sensitive that often eye make up dries them out and I tend to get headaches as a result, meaning that I have to avoid wearing eye make up for periods. So yeah, as a whole I do like the ease-of-carry of this kit, and for £6.95, it's a pretty decent price. It'd definitely ideal for travelling, but I don't think that I'd use some of the products at any other time than when I'm travelling. It's also a great kit if, like me, you want to try out products without buying them full price, and I'm seriously considering venturing to buy the Deep Balance Toner. I just wish that they would bring out a travel-size kit for Oily Skin. You can pick up this kit from the Madara website.